LASP scientist and CU-Boulder Department of Geological Sciences Assistant Professor Brian Hynek led a recent study detailing the earliest history of the development of the Tharsis volcanoes on Mars. The Tharsis region, one of the most prominent features on Mars, covers one quarter of the planet, rises 10 km above the surrounding flatlands, and has had near-continuous volcanic activity for roughly 4 billion years. Along with CU-Boulder Physics Professor Shijie Zhong, Research Associate Ondrej Sramek, and postdoctoral student Stuart Robbins, Hynek modeled the source and pathway of the enormous plume ultimately responsible for the formation of the Tharsis bulge, which geological evidence suggests is responsible for the largest accumulation of volcanic material in the solar system and has been implicated in a warmer, wetter historic Mars. The paper, titled “Geological evidence for a migrating Tharsis plume on early Mars,” was published in the September edition of Earth and Planetary Science Letters. 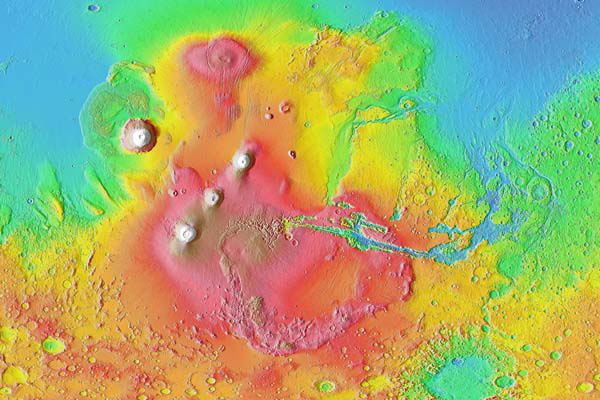 Hynek and his colleagues used geologic mapping, analysis of impact craters, and the remnant magnetization of Mars’ crust to detail the migration track. Their model demonstrates that the plume, or volcanic hot spot, responsible for Tharsis began near the Martian south pole and ended in its current location on the equator—some 4,000 km away—about 3.7 billion years ago. The migration resulted in significant volcanism at the surface that buried an older, cratered terrain. The results have significant implications for mantle dynamics, resultant crustal magnetic signatures, and the early geologic and climate history of Mars. The new findings corresponded to earlier predictions in a theoretical model of Zhong (2009, Nature Geosciences). To read the full paper, visit http://www.sciencedirect.com/science/article/pii/S0012821X11004845. To read the related Lunar and Planetary Science Conference publication, visit http://www.lpi.usra.edu/meetings/lpsc2011/pdf/1603.pdf. Brian M. Hynek, Stuart J. Robbins, Ondřej Šrámek, Shijie J. Zhong, Geological evidence for a migrating Tharsis plume on early Mars, Earth and Planetary Science Letters, Volume 310, Issues 3-4, 15 October 2011, Pages 327-333, ISSN 0012-821X, 10.1016/j.epsl.2011.08.020.